Alexander Schneider (Abram Szneider) was a Russian (Lithuanian) violinist, conductor, and teacher born on October 21, 1908 (Heifetz was 7 years old.) He is remembered as the second violinist of the Budapest String Quartet, with which he played for about 23 years, and as Pablo Casals' close colleague. As a teenager (1924), he studied at the Hoch Conservatory (a private music school in Frankfurt, Germany) under Adolf Rebner. At age 19, he was concertmaster of the orchestra at Saarbrucken (1927), and of the North German Radio Broadcasting Orchestra in Hamburg from 1929 until he was dismissed (1932). He then joined the Budapest Quartet, which was also based in Germany (Berlin), as second violinist. The quartet made most of its living outside Germany but it, too, was forced out (1934.) They then settled in Paris. They were touring the U.S. in 1939 when war broke out - since then, the U.S. was their home. Schneider left the quartet in 1944 and pursued a career as a soloist and music festival organizer for more than a decade. He returned to the quartet in 1956 but continued to work on projects independently. 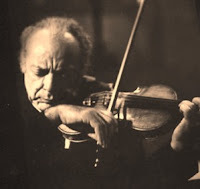 After the quartet retired in 1967, Schneider kept working as a freelance violinist, organizer, and teacher. He died on February 2, 1993, at age 84.